October is here. AESU, the most trusted name in travel, has decided to celebrate the only way we know how…by highlighting some of the creepiest, crawliest, and spookiest places around the world. This week we are going to explore Edinburgh Castle, one of the spookiest attractions Scotland has to offer. Dominating the skyline of Edinburgh, Edinburgh Castle is one of the most popular tourist attractions in all of Scotland. Steeped in over one thousand years of history, the castle is also said to be one of the most haunted spots in the country. Visitors have claimed to have seen everything from a headless drummer and the spirits of French prisoners to the ghost of a dog wandering in the grounds. And did we mention that Edinburg itself is said to be the most haunted city in all of Europe? Double spooky! Edinburgh Castle sits atop Castle Rock, an extinct volcano, and due to its natural defenses has served as both a stronghold and the seat of Kings. To its north, south and west, the castle is protected by sheer cliffs rising 400 feet above sea level. The only access to Edinburgh Castle is via a steep road on the eastern side. Several hundred years ago, a series of tunnels was discovered under Edinburgh Castle, connecting it to Holyrood House, a premier royal residence in Scotland. A piper was sent to explore these tunnels, all the while playing his bagpipes so others could track his progression. Then, without warning, the bagpiping stopped. When a search party was sent to find the man, no trace of the piper could be found. Many people claim to have seen a headless drummer and have heard ghostly drums within Edinburgh castle. However, the drummer only appears when the castle is under attack, which hasn’t happened in quite some time. 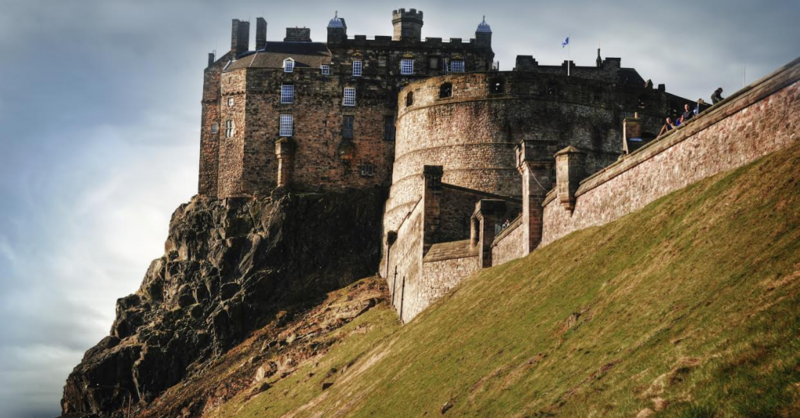 In 2001, Dr. Richard Wiseman, a psychologist from Hertfordshire University, and 240 volunteers studied Edinburgh Castle and several other sites throughout the city as part of a 10-day study. Using a wide variety of high-tech tools – thermal imagers, geo-magnetic sensors, temperature probes, night vision equipment and digital cameras – Dr. Wiseman and his volunteers examined each location for signs of paranormal activity. If you have any questions about Edinburgh Castle, please contact AESU by calling 800-638-7640 or fill out the contact form found on our website. And don’t forget to check out all of our great Travel Tips, especially the Travel Tips for Europe, before you head overseas. This entry was posted on Thursday, October 9th, 2014	at 1:22 pm	. You can follow any responses to this entry through the RSS 2.0	feed. Both comments and pings are currently closed.